This article is about the film Tsotsi. For the language, see Tsotsitaal. Tsotsi is a 2005 film directed by Gavin Hood and produced by Peter Fudakowski. It is a adaptation of the novel Tsotsi, by Athol Fugard and a South African/UK co-production . The soundtrack features Kwaito music performed by popular South African artist Zola as well as a score by Mark Kilian and Paul Hepker featuring the voice of South African protest singer/poet Vusi Mahlasela. Set in an Alexandra slum, in Johannesburg, South Africa, the film tells the story of Tsotsi, a young street thug who steals a car only to discover a baby in the back seat. The film won the 2006 Academy Award for Best Foreign Language Film and was nominated for the Golden Globe for Best Foreign Language Film in 2006. Because his mother is dying of a terminal disease, David (Benny Moshe) runs away from an abusive father and lives with other homeless children in a series of large concrete construction pipes. A few years later, David, who now goes by the name Tsotsi (Presley Chweneyagae), is the leader of a gang which includes his friends Butcher (Zenzo Ngqobe), Aap (Kenneth Nkosi) and Boston (Mothusi Magano). After getting involved in a murder committed by Butcher during a mugging, Tsotsi and Boston get into a fight which leaves Boston badly injured. Tsotsi later shoots Pumla (Nambitha Mpumlwana), a young woman, while stealing her car, only to discover a three-month-old baby boy in the back seat. Tsotsi hastily strips the car of its valuables and takes the baby back to his shack. Pumla survives the attack and works with a police artist to create a composite sketch of Tsotsi's face, which is then run in the newspapers. Realizing that he cannot properly care for the baby on his own, Tsotsi spots Miriam (Terry Pheto), with a young child strapped to her back, collecting water from a public tap. He follows her to her shack and forces her at gunpoint to feed the kidnapped child. Meanwhile, rich gang leader Fela (Zola) begins attempting to recruit Aap, Boston and Butcher to work for him. When Tsotsi takes the child to Miriam a second time, she asks him to leave the boy with her so that she can care for him on Tsotsi's behalf, and Tsotsi agrees. Tsotsi decides to take care of the injured Boston, and has Aap and Butcher take Boston to his shack. Boston, who is called Teacher Boy by his friends, explains that he never took the teachers' examination. Tsotsi tells him that the gang will raise the money so that Boston can take the exam, which means they will have to commit another robbery. Tsotsi and Aap go to Pumla's house. When Pumla's husband John (Rapulana Seiphemo) returns from the hospital, they follow him into the house and tie him up. Aap is assigned to watch John while Butcher ransacks the bedroom and Tsotsi collects items from the baby’s room. When Aap goes to raid the fridge, John activates the alarm. In a panic, Butcher attempts to kill John with John's pistol that he found, but Tsotsi shoots and kills Butcher with his pistol and he and Aap escape in John's car moments before the security company arrives. Traumatized by Tsotsi's killing of Butcher and fearing that Tsotsi will one day harm him too, Aap decides to leave the gang and quit as Tsotsi's friend. When Tsotsi goes back to Miriam's house she reveals that she knows where he got the baby, and begs him to return the child to his parents. Tsotsi sets off to return the baby. He reaches John's house, tells John over the intercom that he will leave the child outside the gate. Meanwhile, an officer stationed at the house alerts Captain Smit (Ian Roberts), who rushes to the scene, arriving just as Tsotsi is about to walk away. The police train their guns on Tsotsi, ordering him to return the baby. However, John urges them to lower their weapons so that he can retrieve the baby himself. As Tsotsi holds the baby in his arms, John convinces him to give up the baby. Tsotsi emotionally hands the baby to John, then is told to put up his hands and turns himself in as the film ends. The film ends with Tsotsi raising his hands, and does not disclose what happens thereafter. 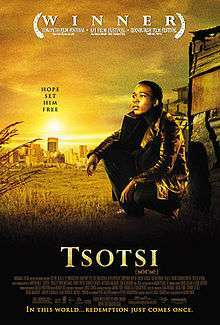 Two unused endings were shot for the film, which can be seen on the Tsotsi DVD. In one, Tsotsi is shot in the shoulder, and while the officers are shocked at what happened, he escapes through a large field back to the Soweto slums after avoiding another shot from the chief police officer. In the other, Tsotsi is shot in the chest while reaching for the baby's milk. He collapses and dies while John and Pumla look on in horror. Presley Chweneyagae as David / Tsotsi: The anti-heroic leader of a gang of small-time thugs. His name, in Tsotsitaal, means "little gangster". Mothusi Magano as Boston / Teacher boy: A member of Tsotsi's gang and a heavy drinker, Boston was studying to be a teacher before he quit college and moved to the shacks. He frequently pleads for decency and moderation in the gang's dealings. Kenneth Nkosi as Aap: Tsotsi's childhood friend. Aap is obedient and happy-go-lucky, and relies on Tsotsi heavily, rarely thinking for himself. His name, in Afrikaans and Tsotsitaal, means "monkey". Zenzo Ngqobe as Butcher: The fourth member of Tsotsi's gang, and the most violent, Butcher is a cheat and a loose cannon who does not hesitate to commit murder. Jerry Mofokeng as Morris: A beggar who worked in the gold mines until he was permanently crippled when a beam fell on his legs. Terry Pheto as Miriam: A widow with a young son who lives near Tsotsi in the slum. Nambitha Mpumlwana as Pumla Dube: The mother of the kidnapped child. Rapulana Seiphemo as John Dube: The father of the kidnapped child. Ian Roberts as Captain Smit: An Afrikaner police captain. The film received positive reviews from critics and has a "certified fresh" score of 82% on Rotten Tomatoes based on 128 reviews with an average score of 7.4 out of 10. The critical consensus states "Chweneyagae's powerful performance carries this simple yet searing tale of a shantytown prostitute redemption." The film also has a score of 70 out of 100 on Metacritic based on 35 critics indicating "generally favorable reviews". Roger Ebert gave the film a four out of four star rating and stated in his review " How strange, a movie where a bad man becomes better, instead of the other way around. "Tsotsi," a film of deep emotional power, considers a young killer whose cold eyes show no emotion, who kills unthinkingly, and who is transformed by the helplessness of a baby. He didn't mean to kidnap the baby, but now that he has it, it looks at him with trust and need, and he is powerless before eyes more demanding than his own. [...] How the story develops is for you to discover. I was surprised to find that it leads toward hope instead of despair; why does fiction so often assume defeat is our destiny?" Tsotsi won the 2005 Academy Award for Best Foreign Language Film and was nominated for the Golden Globe for Best Foreign Language Film in 2006. Gavin Hood was also nominated for the 2005 Non-European Film - Prix Screen International at the European Film Awards for his work on the film. ↑ Bradshaw, Peter (2006-03-17). "Tsotsi". The Guardian. Retrieved 2009-04-27. ↑ "Golden Globe nominations announced". Time Out. 2005-12-14. Retrieved 2009-04-27. ↑ Hernandez, Eugene (2005-11-15). "11 Films Vying for Best non-European film". indieWire. Retrieved 2009-04-27.